Description - Grid-Loc Vented series tiles are engineered to withstand the harshest garage environments available and allow proper drainage between tiles in wet environments. These tiles are capable of handling extremely heavy rolling vehicle loads and are resistant to oil, grease, antifreeze, and many other household chemicals. These tiles are also stain resistant, odorless, slip resistant, and UV stable. 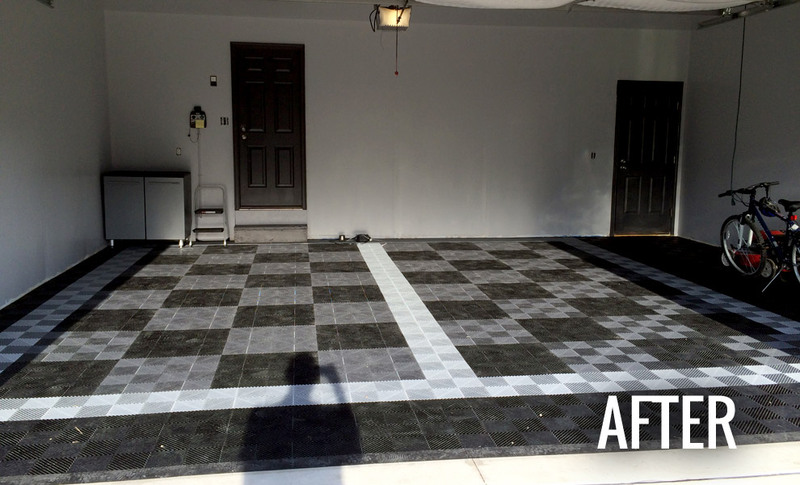 Installation is as easy as snapping together adjacent garage tiles to form a beautiful and customizable garage flooring surface. These tiles also lock together well with our diamond or coin Grid-Loc tiles to form custom designs if desired. 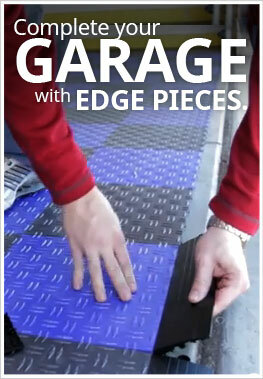 These garage floor tiles also come with an industry leading 15 year warranty. Material – Constructed of high quality impact resistant polypropylene (extremely durable hard thermoplastic polymer). This ensure color fastness, durability, and chemical resistance. Recommended Uses – Grid-Loc Vented series tiles are truly built to be a durable multi use floor tile. 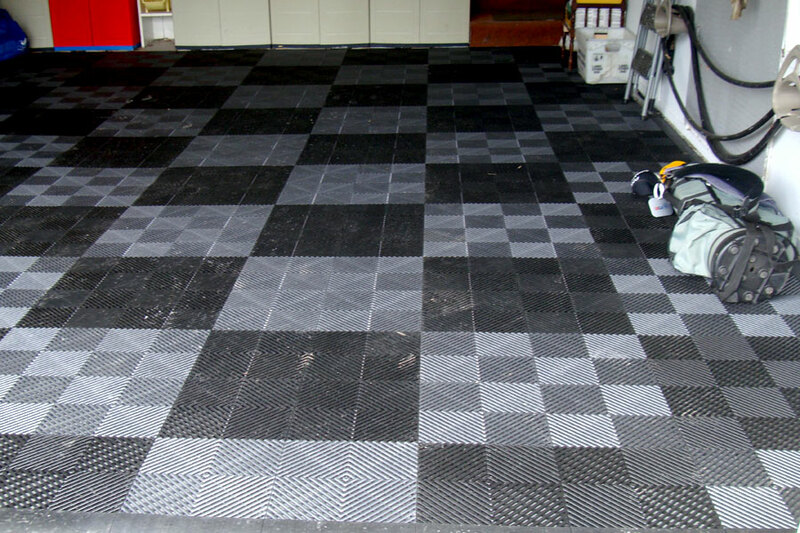 These tiles are most commonly used as garage tiles however they have also been used successfully as a flooring option in tool and storage sheds, as trade show flooring, in auto dealership show rooms to accent cars, and on auto and car show display floors. Vacuuming any loose crumbs, dust, or debris from the tiles with a shop vac. Blow the tiles out with a leaf blower or air compressor hose. Hose out the floor tiles with a garden hose. 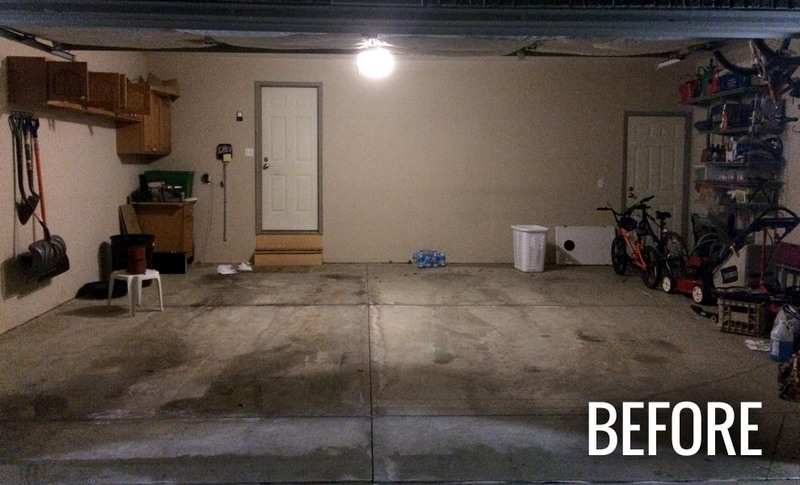 This is normally only recommended if you are sure your garage floor is pitched correctly so that all water flows out toward your garage door. Special sized vents won't trap debris and dirt. Ultra durable, UV stable, impact resistant plastic. Will the vented grid lock and/or coin grid lock tiles follow the contour or low spots on the garage floor where water normally will puddle or do I have to fix those low spots first? Is shimming an option? How? The Vented Grid-Loc and Coin Grid-Loc tiles are a hard plastic tile. They will not contour with the low spots in your floor but will lay over top of them if they are small. If there are large low spots, you may have issues with the tiles interlocking properly. In this case you would have to fix the subfloor for the tiles to properly interlock. Shims probably would not work in this situation because they are typically used to fill small gaps or spaces between objects. Are these mold/mildew resistant like the ones for wet locations like gyms? Our Vented Grid-Loc Tiles are mold and mildew resistant. How do these hold up to hot tire marking? 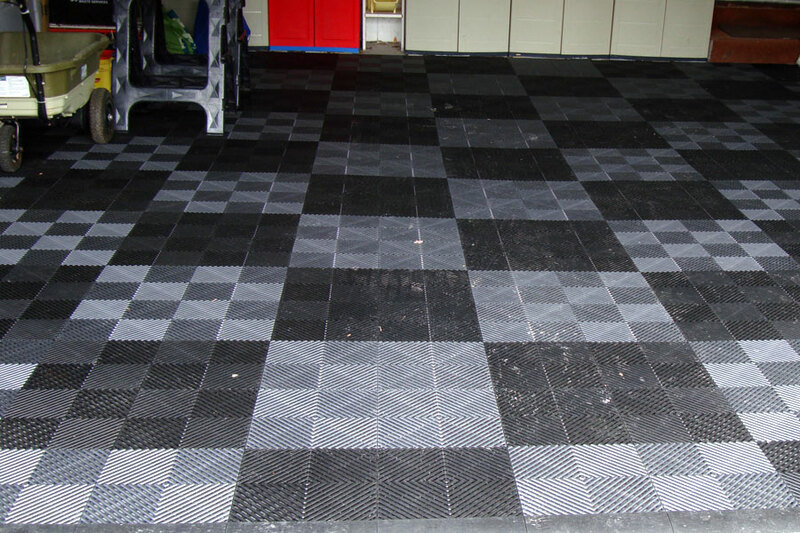 Our Vented Grid-Loc Tiles are made from a hard polypropylene plastic and will not be damaged by hot tires. I am looking for a tile that will stand up to the direct sunlight of southern Florida. I want to place them on my driveway. Will the grid lock tiles fit this need? Our Vented Grid-Loc Tiles work fine in direct sunlight. How do you clean these tiles from winter chunks of snow-ice dropping from car tires? The top of the tiles are very dirty from snow slush. The best way to clean our Vented Grid-Loc Tiles is to mop the tiles with a mild soap and water solution and to rinse them with a hose. This will ensure any stuck on dirt and debris is removed. Garage is 20x25 and I used the handy online design tool. I'm simply not an overly talented DIY guy but these we so easy to install. I did have a neighbor cut all the perimeter pieces on his band saw which was a time saver. I know the instructions and video say all you need is a utility knife but these vented tiles are thick and the vented spaces make it somewhat challenging to cut quickly with that knife. There's a video online showing how to use a tile cutter with these exact tiles as well. With that being said, my wife and I couldn't be happier with the results. Every neighbor that stopped by thinks they look amazing. I almost went with the Diamond Grid-Lock which are less expensive but with Michigan winters I felt the vented made more sense so the water has somewhere to go. Your product transformed my garage into a beautiful part of my home. The pitted cement floor needed to be repaired. Luckily I found your product on the Internet. It was the least expensive solution compared to Nature Stone or a new cement floor. Everyone that has seen the new look could not believe the transformation. Love, love, love the look of these tiles in our garage & extended to the front porch. Every person who has seen it, love it also. They were so easy to install, they just snap together or apart, and easy to cut with a jigsaw. We're using the extra for outside doormats. Highly recommend! Only recommendation to company- we wanted the dark brown but did not find the edging for that color, so we ordered the dark gray, but still love it too. The storage area under the seats of my pontoon boat are open 3/8" all around for ventilation. This is a good idea except when you wash down the deck and items such as life jackets get wet. I used the vented grid lock tiles to elevate everything up off the floor which allows most of the water to pass under what is stored in the compartments. Whatever is left dries easily.